When buying a new duvet there are a few things you need to consider to make sure you get the duvet that is perfect for you. Are you or your partner a "duvet hog"? If the answer is a resounding yes then maybe you need to think about getting a larger duvet. If you have a Double bed then "size up" to a King Size duvet and if you have a King Size bed then why not go for a Super King size duvet. 4.5 Tog - Generally used during the summertime as these duvets trap little heat. 7.5-10.5 Tog - Usually used during the cooler Spring and Autumn months, although many people choose to use these duvets year round. 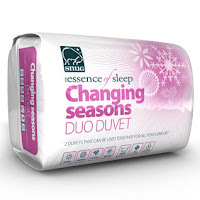 13.5-15 Tog - Warm and cosy duvets which are generally used during the winter months. 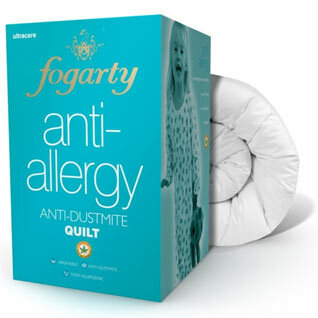 Get a great nights sleep with this Fogarty luxury 12 tog anti allergy duvet. Perfect for the coming Autumn months as it will provide warmth but won't be as warm as a winter weight duvet. 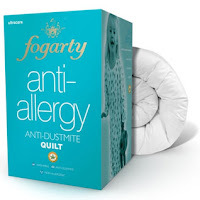 This duvet has an ultracare hollowfibre filling which protects against dust mites. It feels fantastic to the touch, features a cotton rich covering and is machine washable. This Snug changing seasons duvet contains 2 duvets and is perfect all year round. The first duvet is 4.5 tog, perfect for the summer months. The second duvet is 9.5 tog, which is ideal for the cooler Spring and Autumn months. The 2 duvets can then be put together to make a 13.5 tog duvet, which is perfect for keeping you warm on those chilly winter nights.